First launched in 2009, the Wide-field Infrared Survey Explorer (WISE) spacecraft has been asleep in polar orbit for two years. Next month, it'll be turned back on to help locate potentially dangerous near-Earth objects. To help in the search for asteroids and other near-Earth objects (NEOs), NASA has announced that it will bring the Wide-field Infrared Survey Explorer (WISE) spacecraft out of a two-year hibernation next month. The craft, which is still in a polar orbit, will spend at least the next three years looking for objects that could pose a danger to Earth as well as those that could become candidates for NASA's asteroid retrieval initiative. 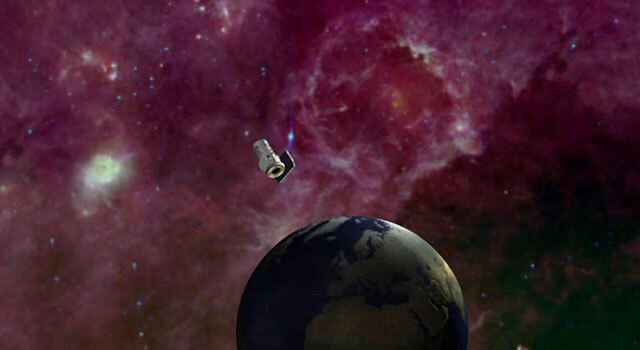 First launched at the end of 2009, WISE's initial mission involved scanning the skies in infrared light, searching for hard-to-find objects both near and far and capturing over 2.7 million images before two of its four infrared cameras quit working. With the remaining two, it performed a complete scan of the solar system's main asteroid belt before going into hibernation in early 2011. By calling the spacecraft into service again, NASA associate administrator John Grunsfield says the agency "is now extending [WISE's] record of success...Reactivating WISE is an excellent example of how we are leveraging existing capabilities across the agency to achieve our goal."